With the growing list of easily accessible ARM hardware like the RaspBerry Pi 2 and the ODROID-C1, several community efforts have sprouted, working out the details for getting CentOS-7 built and available for the new boards. 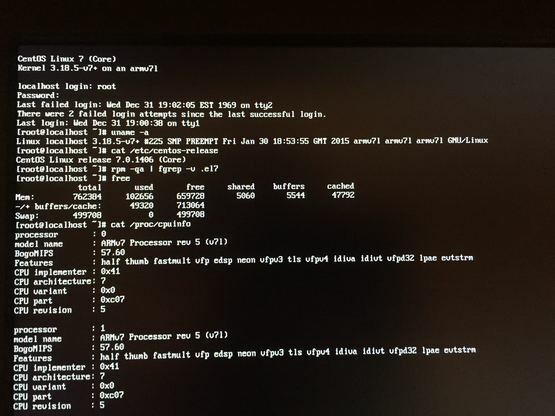 One of our UK based community members has made the most progress so far, posting his build process on the CentOS arm development list. As he progresses, he's also been keeping some fairly detailed notes about what changes he's had to make. Once he's been able to produce an installable (or extractable) image, we'll see about incorporating and maintaining his changes as branches in git. With a bit more work, we should be able to start rolling out a fully community built and supported 32bit arm build of CentOS-7. Far from stopping there, work is underway on the 64bit ARM front as well. The fine folks at Applied Micro were kind enough to lend us two of their X-C1 ARMv8 development kits. After a bit of work to replace the default uboot with UEFI, and a few early missteps, the work on an aarch64 port of CentOS-7 is progressing along rather nicely as well. I'll work on documenting the build system, steps to duplicate for anyone who has the hardware and wants to participate, and potential changes required. If you'd like to get involved or want to follow the progress of the work, please join our arm development list, or join us in #centos-devel on freenode irc. 1. Contact the upstream for the repository and get them to fix the problem. packages for the previous distribution release still work). 4. Configure the failing repository to be skipped, if it is unavailable. I have the same issue as above, how to fix it? thanks. is there a browser that could be installed on Centos7 on Raspeberry PI 2 or 3? I had a RPi3, running centos7, can i install Gnome Desktop? i tried,but failed.